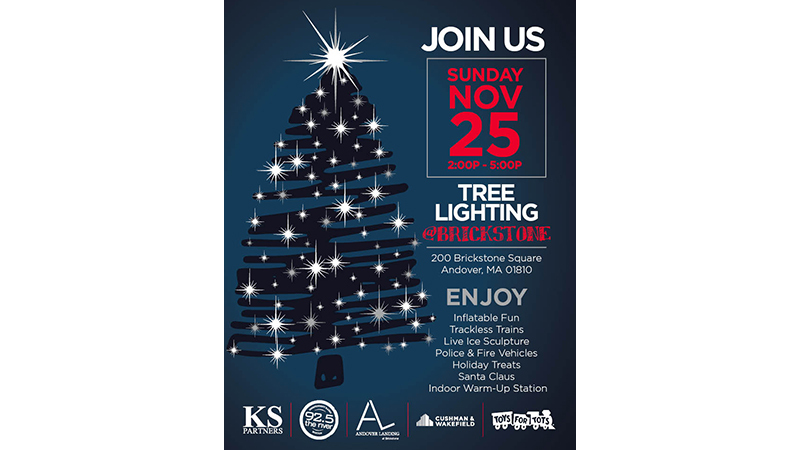 KS Partners and the Brickstone Square community would like to extend a cordial invitation to all residents of Andover and neighboring towns to our 2018 Tree Lighting Brickstone. Join the Brickstone community and 92.5 The River from 2-5pm for an afternoon of inflatable fun, Santa, prizes, holiday treats, trackless trains, police and fire vehicles, kid’s crafts, a live ice sculpture demonstration, musical performances, and more. 3:30PM – Santa’s Arrives via Helicopter!